According to a recent study published in a reputed journal, people sleep late at night due to over usage of cell phones and doctors suggest that if a person needs a decent sleep, he/she should not use a mobile phone or electronic devices. In recent days. This is considered as a psychological problem common among middle-aged people and most adults and teens become victims of the developing health issue. Mobile usage involves Watching YouTube, using Social media websites, chatting all through the night and browsing for a long duration. The study revealed that a person's mindset and mood get disturbed and he rates himself as less happy and develops lower self-esteem due to mobile usage a late night although he uses it willingly. This develops mental depression in them. Also, thinking ability of an individual gets affected due to change in sleep patterns. The study involved the observation of around 90,000 middle-aged people and their circadian rhythm was analysed. Circadian rhythm is a 24-hour cycle developed endogenously (within the human body) in the physiological processes of living beings, including plants, animals, fungi and cyanobacteria. 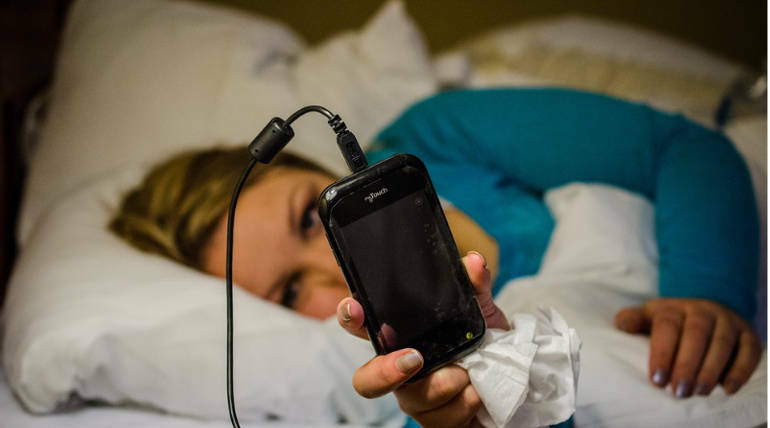 A general solution is not to carry your phone to bed and avoid using mobile on the bed, the next is keep it out of reach or switch it off to avoid cell phone's electromagnetic radiation that is always emitted whenever they are on. A healthy diet and a peaceful sleep can energise a human's mind and make the day productive in his life. "Try not to be active during the night".